Farooq Abdullah made it clear that an independent Kashmir was not a reality as the state is landlocked and surrounded by nuclear powers China, Pakistan and India. In a controversial statement, former Jammu and Kashmir Chief Minister Farooq Abdullah today said that the Pakistan-occupied Kashmir(PoK) belongs to Pakistan and this is not going to change ever. Talking to media persons, the Srinagar MP asserted that even numerous wars between India and Pakistan will not change this reality. “I tell them in plain terms – not only to Indians but also to the world – that PoK belongs to Pakistan and this side to India. This won’t change. Let them fight how many wars they want to. This won’t change,” the former CM was quoted as saying by Greater Kashmir. However, the National Conference Chairman made it clear that an independent Kashmir was not a reality as the state is landlocked and surrounded by nuclear powers China, Pakistan and India. “We are landlocked. On one side we have China, Pakistan on the other side and India on the third side. All three of them have atom bombs. We have nothing except Allah’s name. Those who are talking about Azadi are talking wrong,” he added. 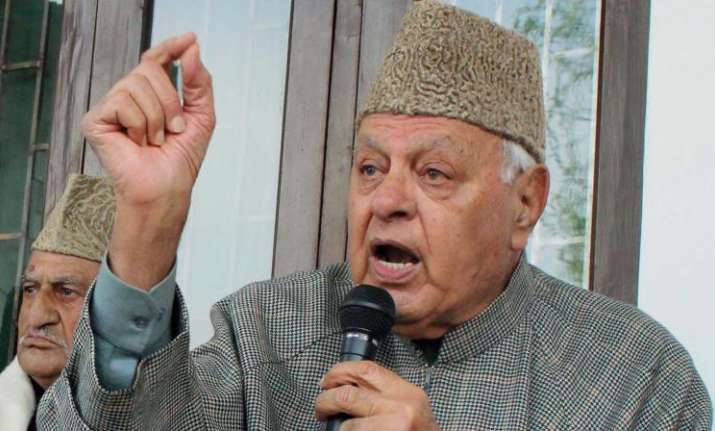 Farooq Abdullah further alleged that India has betrayed Kashmiris and that’s the reason behind the ongoing turmoil in the state. He also claimed that peace will return to Jammu and Kashmir only if autonomy is restored to the state. “India didn’t treat us well. India betrayed us. They didn’t recognize the love with which we chose to join them. That is the reason behind the current situation in Kashmir… Internal autonomy is our right. They should restore it. Only then the peace will return,” he said.